Description Apply a phase rotation to a volume. 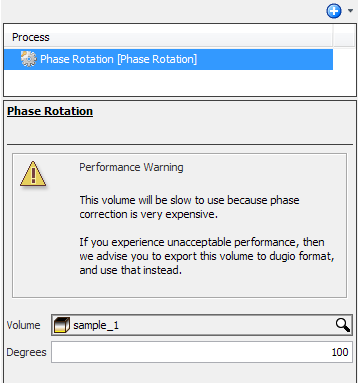 The Phase Rotation process allows you to apply a phase rotation to the volume data. Phase rotation of values other than 0 or 180 degrees is computationally-intensive. The resulting output volume may be very slow to use, particularly when viewing time-slices and amplitude extractions. To avoid performance issues, export the result volume to dugio format (see Exporting a Volume to DUG I/O) and use it instead. In the Details Panel at Volume, select a volume in which the phase rotation will be applied. Type the rotation degree at Degrees. Acceptable value is between -180 and 180 degrees. 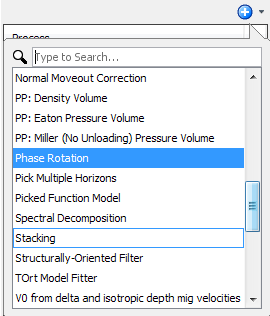 As a result of this process, a new phase rotation volume is available in the Volume tab. Tip: To quickly open the output volume, right-click the process item in the Process tab and click Open Child Volume. Vice versa, you can also open the process from the Volume tab directly. To do this, right-click the volume which was created from the process (indicated in italics) and click Open Parent Process.